We offer "Cutting files and boat plans" for our kit boats. What does this mean ? These Cutting Files are the same AutoCAD files that we send to our cutting shop for the kits to be cut for delivery world-wide. If you prefer to have the kit cut by your local cutting shop, then we can supply the files on a DOWNLOAD or on USB Memory Stick. that will enable you to have the kit cut locally. We use the design criteria in accordance with German Lloyd for category 1 (unrestricted sailing area), which is much better than what CE-A (Europe) and other Classification Societies require. Each set of cutting files comes complete with 15 – 20 sheets of detailed assembly drawings with written instructions and check measurements (Both Metric and Imperial measurements are included) for assembling each part of the kit. The drawings cover assembling the frames, setting up the building jig (included in cutting files) on to I beams or similar base. These extensive and complete drawings take you right through the welding up process and completing the vessel from start to finish. When you use our cutting files ... All plate parts belonging to the hull, deck and superstructure that will be accurately cut to size are included in the cutting files. The programming includes that the parts are marked with the appropriate part number and engraved matching marking lines to assist in the assembly and location of the part in its position. We recommend .... Cutting method of Plasma / Oxygen, ensuring highest accuracy and smooth edges, we also recommend that the plate parts are cut from Lloyds approved A Grade Shipbuilding quality ALUMINUM (as appropriate for aluminum designs) or STEEL (As appropriate for steel designs) that has been coated with factory applied Sigma weld MC welding primer. We also recommend that the steel plate has the official designation ISO standard 10474 or EN 10204 with 3.1.B certificate. If you cut locally we recommend that you use A36 / ABS GRA is the preferred steel quality which is equivalent to the ST37 Grade-A if above steel not available. Openings for windows and doors can be cut or only marked as per the builders preference. The main bulkheads are included in the cutting files and the drawings are included in the plans showing the stiffeners and are in accordance with classification rules and safety regulations. Details of the cold forming of plate parts are included where this requirement forms part of the design. Basic engine foundations are integrated into the cutting parts and assembly details. In these days where both the local authorities and the including better informed builders, it is important that the construction calculations are in accordance with prevailing classification society so this factor is part of the preparation of any Bruce Roberts set of cutting files. See left ... This is a set of parts cut and laid out as they will be assembled into your hull deck and superstructure. There is a lot more information all about the cutting files and kits in the book METAL BOATS. This is the type of machine your local cutting shop will use to cut out your kit. CUTTING FILES CAN BE NESTED TO A VARIETY OF SHEET SIZES. Regards sheet sizes used to nest the cutting files. We are prepared to re-nest the parts on to smaller or larger or different size plates but the following should be kept in mind. If the kits is cut from plates that are too small; A width of say 1200 mm / 4 ft is considered too narrow and for best results the plates should be at least 1.8 m / 6ft wide. Due to the enormous amount of extra welding involved, the chances of having a perfectly fair hull deck and superstructure will be greatly reduced if your kit is cut from narrow plates. The larger the sheet sizes used to cut the kits ... the smaller number of hull and deck plates ... the fairer the hull. We have cut over 200 kits for sail and power boats ranging in size from 34 ft / 10.4 m to 85 ft / 26 m and in all cases the resulting plates avoided excessive welding and were easily handled using the minimum equipment. In our cutting shops we use 6000 mm x 2000 / 19 ft 6 in x 6 ft - 6 in size sheets and occasionally 8000 mm x 2000 mm / 26 ft 3 ins x 6 ft - 6 in sized plate. We can of course re-nest these parts to shorter plates ( more cutting and welding ) but we feel that the width of the plates is even more important ... any plate under 2000 mm / 6 ft - 6 in in width will mean some hull plates have to be cut lengthwise; not recommended because of excessive welding which will adversely effect the final appearance of the hull. If the larger plates cost more then the extra expense is justified when considering the reasons outlined above. If in doubt, let us know what plate sizes are available locally, try more than one supplier for quotes and most importantly, DO try and obtain pre-shot blasted and primed plates and profiles. Finally make sure you get competitive quotations for both Bruce Roberts and more than one local cutting shop. The local cutting shop may need 'cutting and marking lengths' as this governs the cutting machine times for cutting a particular kit, Bruce Roberts can supply this information. The DRAWINGS associated with a the CUTTING FILES are AutoCAD drawings. If you want to view the Auto-Cad files and do not have a recent version of AutoCAD then you will need to have the drawings printed out by our selves or your local service print center. we do include all the drawings in .DWF or .PDF format ... PLUS we include a reader so you CAN view all the drawings on your computer PLUS you can print them out on the PRINTER attached to YOUR computer. The Various calculations are on XL files so you would need access to MS-XL to read these files or if necessary you have prints made by ourselves or your local print center. The list below represents what is supplied for the Voyager 495-2 A cutting file set, but is also typical of what is included in ALL of the sets of cutting files for other kits. 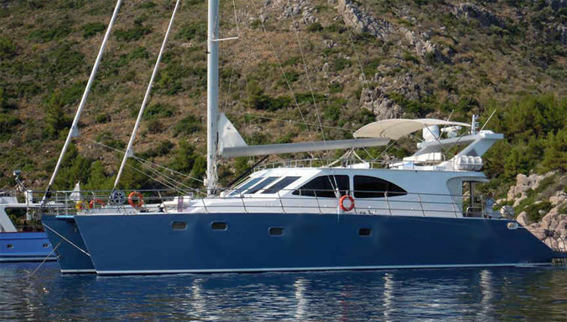 Sail plan including sail measurements, Deck plan, deck fitting layout, rigging plan with rigging sizes etc. .Accommodation profile and accommodation plan with notes on arrangements. .Alternative accommodation plan with Accommodation profile and accommodation plan with notes on arrangements. .Additional detail on deck layout with details of deck equipment and fittings required and suggested layout. .Detailed accommodation plan in both plan and profile with measurements for the interior joinery etc. .Alternate accommodation plan with detailed accommodation plan in both plan and profile with measurements for the interior joinery etc.
. Lines plan with sections, profile with buttock lines and waterlines, plan view with waterlines, hydrostatic calculations shown. .Engine installation details including installation of fuel tanks, all shown in plan, profile and sectional view. Many explanatory notes included on this sheet. Engine room showing details of exhaust system, fuel system several sectional drawings showing all details of fuel tank sections, battery placement plus many notes included on this sheet. .Details of fuel tank construction including venting arrangements, inspection hatches also details of propeller tube and shaft, rudder shaft and bearing etc.
. Details of chain plate construction, sizes, hole sizes for attaching correct size rigging screws, and instructions for cutting to correct dimensions etc. Suggested method of installing chain plates. .Details of how to build the Bowsprit, assembly of rudder and construction of rudder bearings etc. NEST PLOT These are the actual cutting files that are given to the cutting shop. SHEET 2A 02 (3) Shows each frame separately with measurements and layout of the numbered parts that go towards assembling each frame. SHEET 2A 02 (6) Complete welding schedule for all parts of the boat. Each weld is shown in graphic form so all can understand the exact weld required. Sheet 15. Anode sizes and placement. The STUDY boat plans show most of the above sheets of drawings but do not include cutting files! PREPARATION OF CUTTING FILES: Many of you may be surprised that it is not possible to take a regular boat plan even one that is already prepared using the latest computer aided design techniques, and use it for automatic computer controlled cutting. There are many steps between creating the original design and having the boat cut out on a computerized plasma-oxygen cutter. 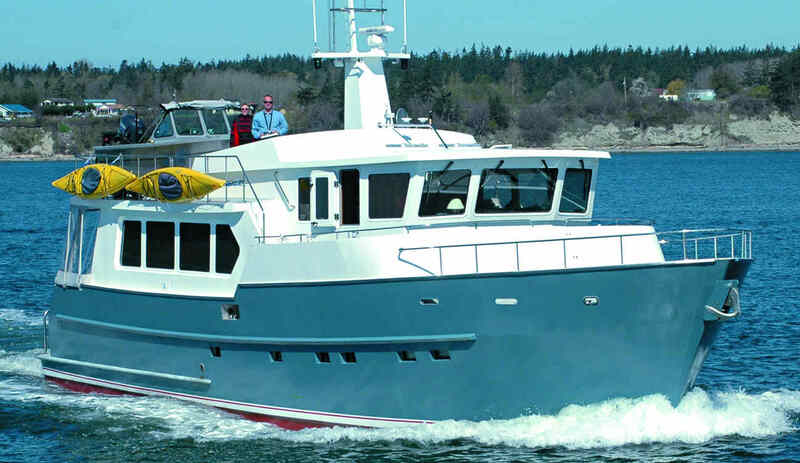 If a particular design is destined to be available as a pre-cut steel or aluminum hull, deck and superstructure package then this should be decided at an early stage in the design program. Some designs can be converted but it is preferable to start with automatic cutting in mind. 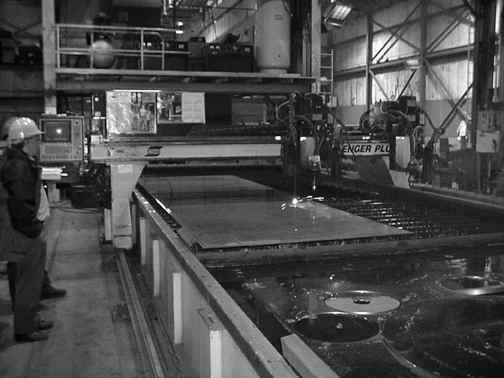 The main steps in preparing a new design for a boat that is destined to be cut out by a computerized plasma-oxygen cutter is as follows. Firstly it is usually the customer who gets the process started by contacting the designer with a brief outline of what they have in mind. Further correspondence quickly establishes the clients wish list. The list usually includes things such as type and style of boat, intended usage, overall length and beam. Draft limitations should be specified at this stage. 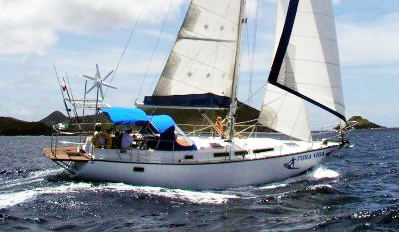 Accommodation requirements, number of regular crew as opposed to occasional guests should be stated. Speed requirements are important as are the clients attitude to fuel costs. This list may need some refining as some elements may conflict one with the other. It is part of the designers brief to ensure that the client ends up with a boat that meets most if not all their desires and overall requirements. So far the process is very similar to what would be followed no matter from which material or building method was to be used to construct the vessel. The next step is that the client and designer enter into a (in our own case) simple agreement where the designer agrees to prepare preliminary boat plans for the proposed vessel for a reasonable (a relative term!) fee. In our office we consider that the lines plan, general arrangement drawings consisting of exterior profile, deck plan, accommodation profile and plan views plus sufficient calculations to ensure that the final design can meet the clients requirements, constitutes a Preliminary plan. Before a preliminary plan can be produced it is necessary to produce a 3D computer generated model of at least the hull of the vessel. 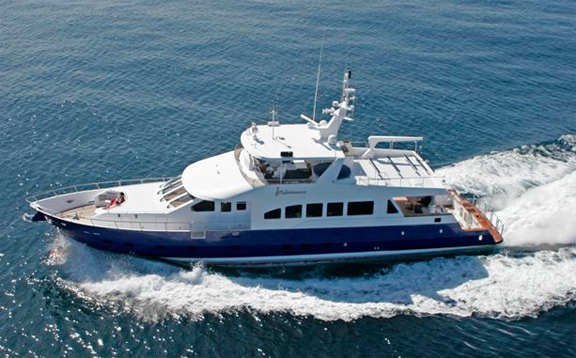 Once the preliminary boat plans are completed and both the designer and the client are satisfied with the overall concept and layout of the vessel then we can proceed to preparing the complete boat plans for the vessel. For the design to move forward it is now necessary to complete the 3D computer model that would at this stage need to include all items such as hull including transom, keel and rudder, all decks, cockpits, complete superstructure, main interior bulkheads and any other features such as Flybridge, radar arch, exhaust stack. Special items such as transom steps and other similar features are all included in this model. Depending on the complexity of the design, this process can take between 500 and 600 design man hours. From this model all of the salient hydrostatics such as detailed weight calculations to enable material requirements and final displacement to be calculated. This allows stability calculations to be made at this time. During this process fine-tuning of the model can be undertaken to make sure that the finished vessel will meet all the design requirements. Once the 3D model is completed and checked, then copies of this model are provided to the specialized designers who prepare the final model that includes all the scantlings such as transverse and longditunal framing, sole bearers, deck beams and engine beds. This same team then separate out all the parts for the frames, stringers, engine beds, bulkheads, hull, deck and superstructure plating etc., and add notches to the frames and bulkheads before nesting the parts on plates. The design team put the correct number on each item and also reference lines are drawn on each part to represent frame locations etc. The purpose of the numbers is to identify each part and the lines are used during the assembly process to loCATAMARANe frames and other structural members. Next it is necessary to work out a path for the computerized plasma-oxygen cutting machine. The path is the point at which the cutter enters the plate and starts to cut the parts. In addition, the path has to determine which part is cut next and so forth. This is all necessary so that the parts are cut in the correct order. For instance, if a window has to be cut from a cabin side, then the window aperture must be cut before the larger cabin side part is cut otherwise any movement in the cabin side after cutting could cause the window to be cut in an incorrect location. 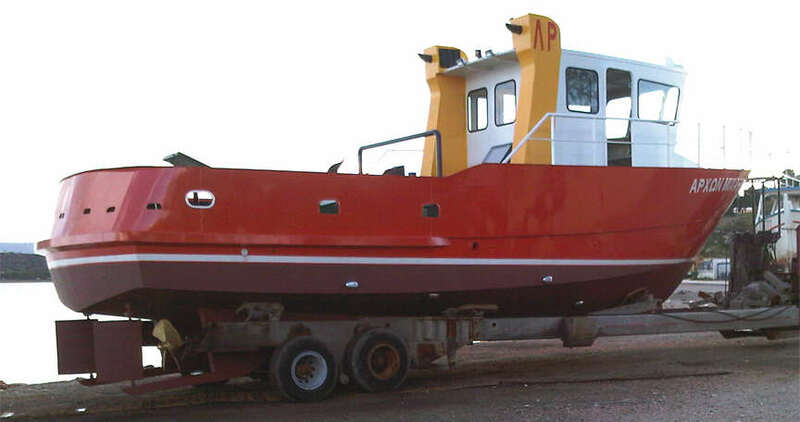 ASSEMBLY boat plans: The assembly boat plans we supply with the CUTTING FILES or KITS cover several sheets of drawings and include all the information that your will need to assemble you kit. Also included are several sheets of engineering drawings showing lay-out of your engine room, exhaust system, steering system, fuel and water thanks etc.